I just finished reading this rental textbook written by Rebecca Skloot: "The Immortal Life of Henrietta Lacks". Skloot wrote this textbook with the heart of a humanitarian & the mind of a research scientist, this textbook is a wonderful combination of a heartbreaking story of one woman and her family, the science behind the world of tissue culture, and the ethics surrounding the advances in science in today's society. Thank you for this astounding work of art. I will be donating to the Henrietta Lacks foundation in honor of the entire family, and I hope many others will read the textbook and be similarly moved. 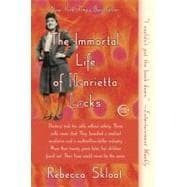 Immortal Life of Henrietta Lacks: 5 out of 5 stars based on 1 user reviews.